At long last, part one of a series on the amazing Stenokey. Stenokey connects to any desktop or laptop PC that has a USB port. It is meant to work with the Open Steno Project's Plover software, which runs on Linux, Mac and Windows. It supports NKRO keyboard emulation, as well as the serial Gemini PR, TX Bolt and ProCAT protocols. In theory, the Stenokey should be compatible with commercial steno software that supports those serial protocols. Stenokey uses the Matias Quiet Linear Switches, which won't stick or stall when keys are pressed off center. Stenokey's smarts come from the Arduino compatible Teensy 2.0. This microcontroller is capable of emulating both an NKRO keyboard and a serial port over USB. The Stenokey circuit board is based on the simple design principle of putting everything on the same circuit board. The advantages are improved reliability, the elimination of unecessary cables and connectors, simplified assembly, reduced assembly time, reduced part count and lower material cost. Hopefully the low material cost puts this project in the realm of possibility for more people. Except for the plastic parts the cost of materials comes out to less than USD$50. Of course if you account for shipping and product minimum orders, you'll spend more. All of the Stenokey design files are available on Github. The circuit boards can be purchased from SeeedStudio. Except for the firmware and electrical schematic, the project is licensed with the CreativeCommons-ShareAlike license. The firmware and schematic are licensed by Emanuele Caruso under the GNU GPL version 3 license. All of the tools used to create the Stenokey project are open source or are freely available so that the design can easily be modified within the constraints of those licenses. To summarize both the CreativeCommons and GNU licenses, you can of course create copies of this project for your own use. You can republish or create derivative works from this project and even sell them as products, however if you do, you must give credit to the original author(s) and share your own work. Be sure to read the actual licenses for all of the details. 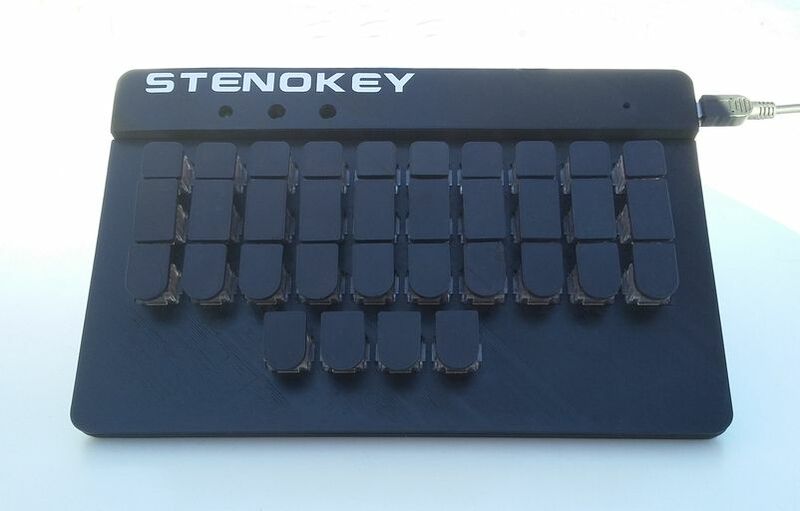 The Stenokey project gained its name when I ran across Jason Cemra's Stenotoppers on Mirabai's Plover blog. 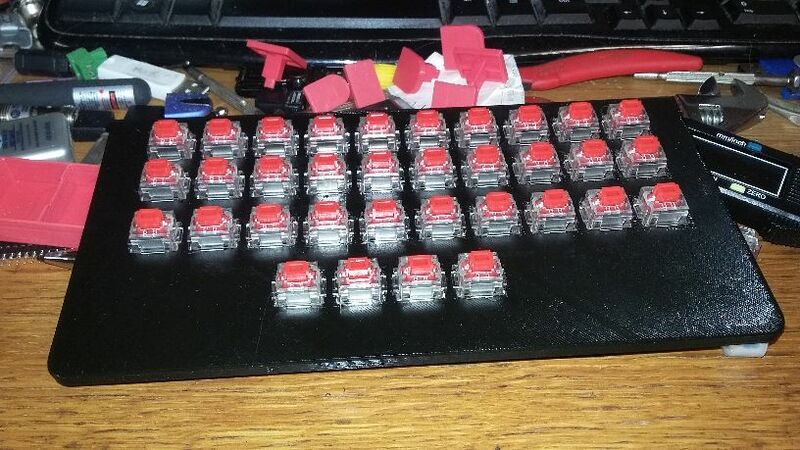 I had recently purchased a small 3D printer, so I decided to try printing one of Jason's key caps. 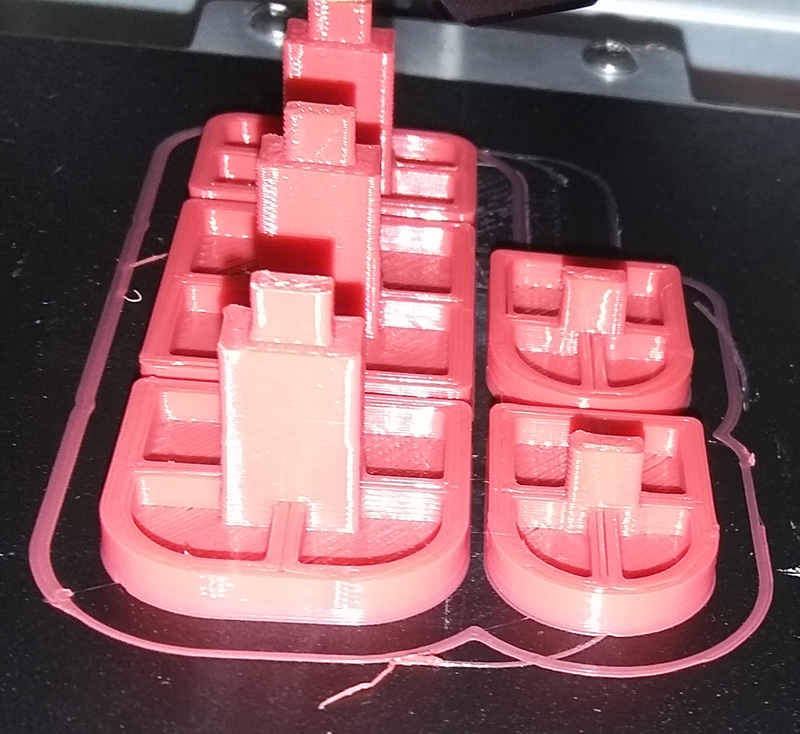 It printed amazingly well. Printing that key was the start of the project as one thing lead to another. I was already familiar with Joshua Lifton's Stenosaurus project from the Plover blog, so I drew up some steno keys based on Joshua's key outlines, (while borrowing some of Jason's 3D design techniques). Those keys also printed well enough. I had drawn the keys in OpenSCAD, so I was quickly able to generate several different variations of keys with various widths and offsets. Next I bought some of the Matias Quiet Linear key switches. (Those key switches were graciously made available by Matias through Joshua's efforts.) I was able to get my key tops to fit the Matias key switches without much effort (and a fingernail file). I quickly found out that unlike the "other" key switches, the Matias key switches don't stick or stall when you press on a key off center. I was also familiar with Emanuele Caruso's Stenoboard project. All of his designs for the Stenoboard project are available on line, including the electrical schematics and the firmware. 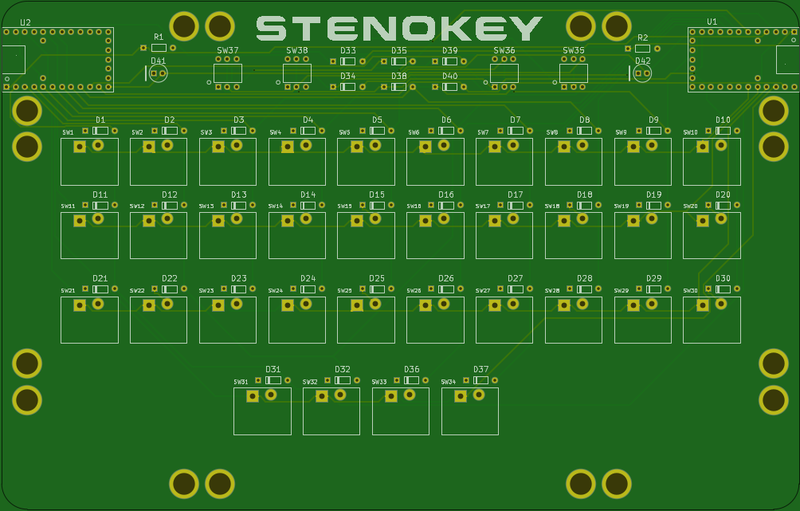 Starting from Joshua Lifton's keyboard layout, I referenced Emanuele's schematics to create the Stenokey circuit board. With the different keyboard layout and schematic, it was also necessary to modify Emanuele's firmware, (which was simple enough to do since he writes excellent code). In the middle of this I contacted Mirabai, because without her none of this happens. She was highly supportive throughout the project. She agreed to check out the design and eventually I sent her my prototype to test. Around the time that I contacted Mirabai, I decided that my prototype design was rather naked; too naked to send to someone else. So I designed some more plastic parts to cover the prototype's bare bottom and top. Those covers weren't very professional, so I designed a clamshell case that neatly encloses all of the electronics. 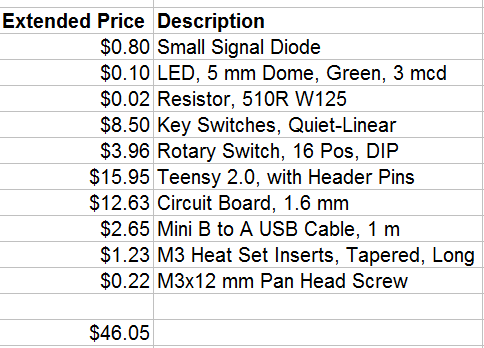 Designing an open source project like this, ordering parts and building a few prototypes are only half of the work. I spent more time cleaning up the files and directories, writing documents and getting everything set up for distribution on Github and SeeedStudio. Hopefully the project will be well received. In the next post, I'll tell you what I think of the Stenokey, after using it for several weeks and passing it around among a number of both pro and amateur stenographers! Plus: Plans for getting Stenokey kits into the Plover Store! How might one go about setting up a tripod for this bad boy?